Excellent detail. An instant classic as usual. Nicely done Chris! Here's a higher resolution version. I have a minor correction to make to the upper compass. Also I triple checked my spelling on all of the countries, but now I know others will check too! Another truely fantastic looking coin, sure to be another Crake classic Will be keeping an eye out for this too, will be getting a few (To keep & travel). Beautiful as always! We wouldn't expect anything less from you. Dude, just when I think you can't top yourself you pull another GREAT one outta your hat!! "Once again" I'm in for a few! I hope the XLE is copper, this coin would look awesome in copper! If so I hope manage to get 1 I work with the stuff everyday and am quite partial to copper finish coins. Wow Chris! Totally awesome. Can't wait to see & hold these coins. Kudos! And oh yeah - love your coin on there! Ditto - what they all said!! I'll also be looking out for this one. Very nice. How do you do it Chris? You totally amaze me when you come up with gorgeous designs. I especially love how it is the plain metal no color, I think it adds elegance. I'll be watching for this one. Wow! Forum icon - go up to the main forums and look at the icons for GPS Garage Sale, GPS and Ham Radio, etc. The thought was "What can I do as a followup to Tracking Time?" and then this idea came to me. There are designs that just happen where I sketch an idea, hop onto my computer, knock it out in very little time, and I know its gonna be great. Then there are designs that I struggle with for months. Symbology was one of the former! Simply stunning, as usual. I'm in! Hello! That's a very nice looking coin!! I hope that you may have some aside for trades too??? Hope you are making plenty of them, this one will sell out QUICK! Really, really nice job on this one! How many levels of height in metal of this design? Its more of a celebration of geocaching.com though, not the game as a whole. This is just one of several listing sites. Ah, but Groundspeak owns the trademark to the term Geocaching. So Geocaching is Geocaching.com. Very nice coin. Will you trade or only sell? Are you sure about that? I seem to remember that being discussed in the forums a couple of years ago and the crux was that since the term had entered into general usage it could not be trademarked. do you see anywhere the ™ symbol on the word geocaching? Veeerrry nice! We'll be patiently waiting to join the reservation list . So just how would one come upon an XLE? Not that it changes anything, or that I really care all that much, but check out USPTO trademark serial number 78045228. Edited since the original link expired. Not that it changes anything, or that I really care all that much, but check out this USPTO entry. I would say that settles that . Fair enough. I guess JI recinded his remarks from 2001. 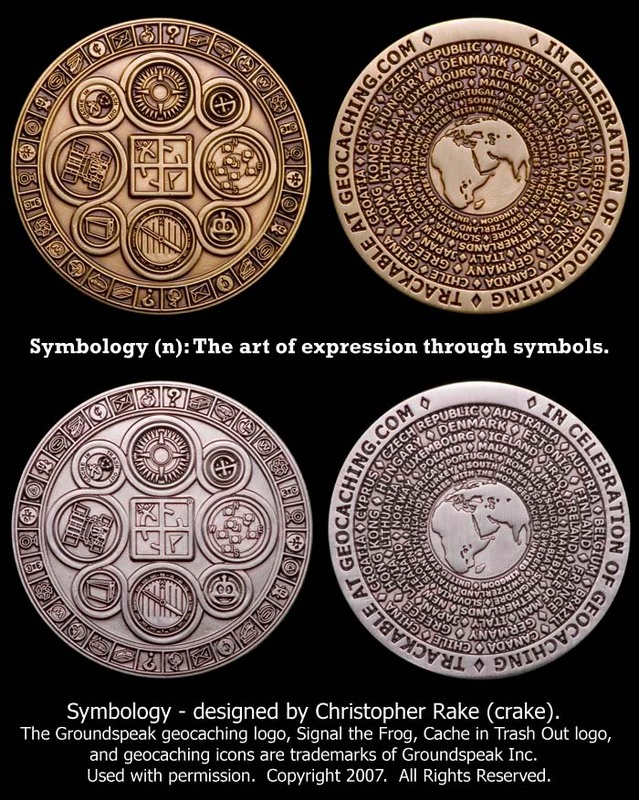 As usual, you have another beautifully detailed coin. Your attention to detail is spectacular! Can't wait for this one and I sure hope I don't miss out. You keep wowwing us with your talent!!! Super coin! Quik question - where will the tracking # appear? Very tight design! Edit - upon closer examination I am guessing in the upper back on the rim - where there is a little blank spot? Can we pre-order please? I'd like 3. And (unlike some coins with maps) it has 'New Zealand' on it! It's beautiful.. can't wait to add it to my collection. My photos always have the tracking number area blank, but yes - the space between the diamonds on the reverse will be the tracking number, nice and large and easy to read! Not yet, but don't worry... you'll have plenty of opportunity to get this guy. AWESOME design and the DETAIL! WOW!!! This is DEFINATELY a must have! Great work! 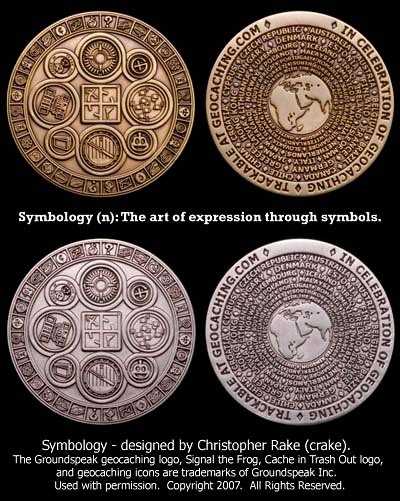 I bet'cha our coin club will be doing a small run of this one....especially since our leader loves symbology!!! WOW! Chris, you are a god! OK, here's the dirt on availability... I plan to have some with me at the TX Challenge in mid-March. Then orders will ship to others in the weeks following. So if you're going to the challenge, come find me - I'll be on the CenTex team helping keep the title! I don't think I will make it there But I will be hangin' out to get some of these beaut coins in hand. Looking forward to getting a few of these. Budget? What's a budget?